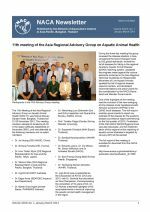 11th meeting of the Asia Regional Advisory Group on Aquatic Animal Health. Aquaculture community mourns Prof. M.C. Nandeesha. Got a story for Aquaculture Asia Magazine? AusAID funded project on Institutional Support for Development of Mariculture in South East Sulawesi commences. Regional training course on broodstock management in aquaculture, Vietnam 27 May - 1 June 2013. Video recordings from workshop on sustainable intensification of aquaculture released! American Soybean Association field trials in China. AusAID funded project on Institutional Support for Development of Mariculture in South East Sulawesi. Income enhancement of farmers through intensive fish culture in polythene lined farm ponds. 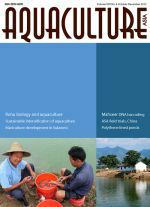 Consultation on Sustainable Intensification of Aquaculture in the Asia-Pacific: Towards a new paradigm. 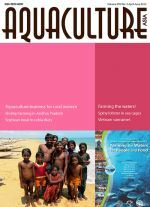 Taxonomic status of mahseer fishes in north-eastern India: A report on the recent DNA barcoding studies. Biology and aquaculture of the rohu, Labeo rohita. The Global Conference on Aquaculture 2010 reviewed the present status and trends in aquaculture development, addressed emerging issues relevant to aquaculture development, assessed opportunities and challenges for future aquaculture development and built consensus on advancing aquaculture as a global, sustainable and competitive food production sector. 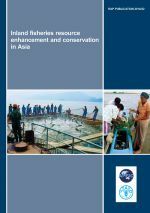 This volume provides information on how aquaculture could be mobilized to alleviate global poverty and improve food and nutrition security in the coming decades. Shrimp farming in Andhra Pradesh, India. Small indigenous freshwater fish species in village community ponds to ensure nutritional security of rural poor. 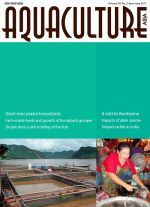 Postlarvae culture and technical status of whiteleg shrimp Penaeus vannamei hatcheries, Vietnam. Jatropha meal as a promising plant protein source for aquaculture feeds. Use of soybean meal in cobia diets. Capture based aquaculture of spiny lobster Panulirus polyphagus in open sea cages. Institutional linkage helping rural women gain employment. 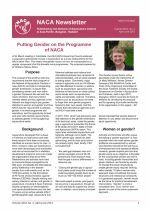 Putting Gender on the Programme of NACA. 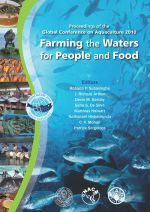 Proceedings of the Global Conference on Aquaculture 2010 available for download. Peter Edwards to mentor the new Sustainable Farming Systems Programme. International Fisheries Symposium, 6-8 December, Can Tho, Vietnam. Broodstock management training course launched by NACA and UNU-FTP. A visit to Vientianne, Lao PDR. Development of captive broodstock of giant river prawn Macrobrachium rosenbergii. Alien introduction and its impact on native fisheries and aquatic bioiversity of West Bengal, India. Ecological impacts of exotic fish species in India. Farm-made feeds support good growth and survivial of the humpback grouper. An easy way to hold live fish. Litopenaeus vannamei introduction: Sound management or expediency? Newsletter and more. This regional review study is an effort to promote improved inland fisheries management under the Code of Conduct for Responsible Fisheries. It covers ten Asian countries with significant inland capture fisheries, namely Bangladesh, China, India, Indonesia, the Republic of Korea, Myanmar, Nepal, Sri Lanka, Thailand and Viet Nam. The papers were presented and discussed at a regional workshop held from 8-11 February 2010 in Pattaya, Thailand. Audio recordings of the presentations are also available for download. Aquaculture is today considered the only viable option for meeting the increasing future demand for fish and seafood products. There are concerns that unconstrained sectoral expansion and intensification, coupled with its ecological and social impacts, globalisation and fluctuation of markets and resources, climate change may have undesirable impacts on the resilience of social-ecological systems. Aquaculture makes demands on, but also can provide a range of ecosystem services. Aquaculture is likely to benefit greatly from the application of appropriate genetic and reproduction biotechnologies to increase food production, but the application of established genetic improvement methods in aquaculture is much less than in agriculture. The world’s wealth of aquatic biodiversity at the genetic, species and ecosystem levels provides great potential for the aquaculture sector to enhance its contribution to food security and meet future challenges in feeding a growing human population. The main objective of this review is to understand the status of aquaculture-fisheries interactions associated with the biological, technological, social, economic, environmental and other aspects of aquaculture development. It will also examine how the interactions are addressed under the EAA. It cover aspects of scoping, prioritising, management tools and plans within the context of the elements of ecosystem resilience, social and economic issues and the integration of aquaculture with other sectors.